As its name suggests, Email Address Collector (EAC for short) helps you filter, scan and collect email addresses from various sources, then save the email addresses to your preferred format. This article details how to use the program under different scenarios. You can also use the program to scan and collect email addresses found in the body content of your emails. For example, if you receive order confirmations by email, you can use it to collect addresses found in the customer information area of such messages. Or you can use it to collect addresses from emails containing submitted web forms, like contact forms. EAC works with all modern versions of Windows, including the x64 versions of Windows 7 & 8.
collect email addresses only from emails that include a certain keyword in the email subject field. All filters have an include / exclude option, so you can choose to collect email addresses only from emails that match your filter or only from those emails that do not match your filter. Not only that you can collect email addresses from emails, but you can also use EAC to scan and collect addresses from Contacts folders of Outlook (Contacts / People folders), Thunderbird (Personal Address Books), Outlook Express and Windows Live Mail (Windows Address Books). 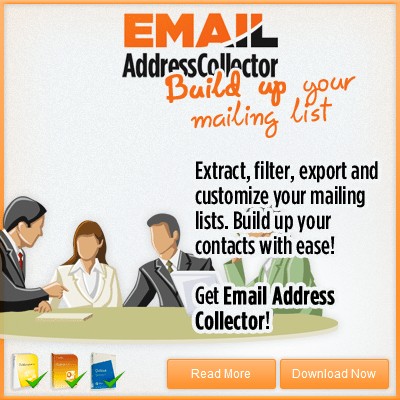 Even more, you can save the collected addresses to all these contact formats, directly through Email Address Collector. On top of its ability to work with email clients, EAC lets you collect email addresses from local files, too. The following file formats are supported: plain text files (txt, csv, html etc), Office files (doc, docx, xls, xlsx etc), PDF documents (encrypted or not). Once collected, you can your save email addresses list as a standard CSV file or as entries in your favorite Contacts structure. You can also save the collected email addresses as an Outlook distribution list (Contacts group) or you can simply copy & paste the list to your favorite program (like Microsoft Excel). 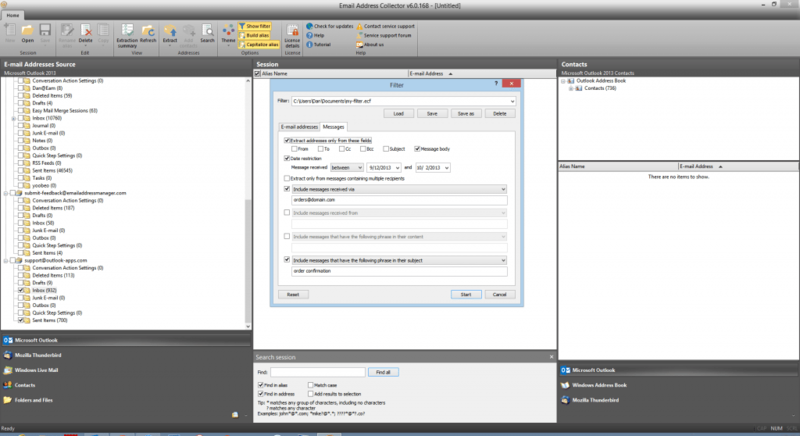 Here is the download link for the latest version of Email Address Collector. how does it handle duplicates? It automatically removes the duplicates during the extraction process, so you end up with a list of email addresses with no duplicates.